"A woman needs ropes and ropes of pearls." - Coco Chanel. "All art is autobiographical. The pearl is the oyster's autobiography." - Federico Fellini. A PEARL is a hard object produced within the soft tissue (specifically the mantle) of a living shelled mollusk. Just like the shell of a clam, a pearl is made up of calcium carbonate in minute crystalline form, which has been deposited in concentric layers. The ideal pearl is perfectly round and smooth, but many other shapes of pearls (baroque pearls) occur. The finest quality natural pearls have been highly valued as gemstones and objects of beauty for many centuries, and because of this, the word pearl has become a metaphor for something very rare, fine, admirable, and valuable. 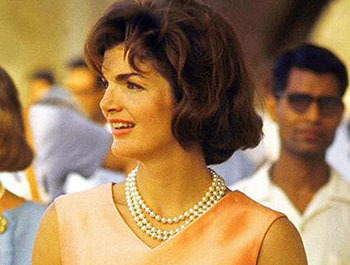 Beyond the perfect strand - the modern way to wear pearls. FAMOUS PEARLS - "The World's Largest Pearl Information Source." 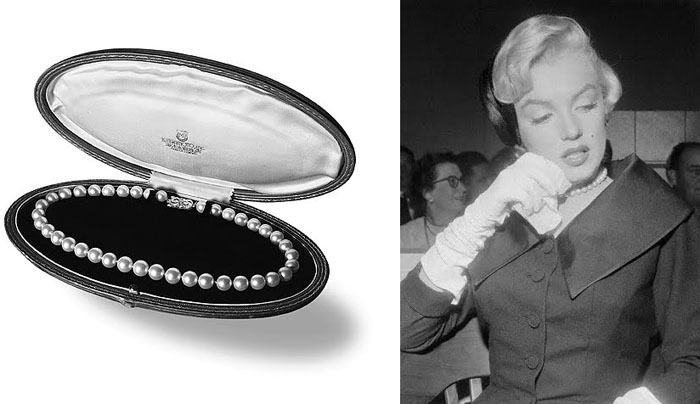 Marilyn Monroe Shows Off Prized Mikimoto Pearls From Joe DiMaggio - JCK Magazine. PEARL-GUIDE - "The World's Largest Pearl Information Source." Akoya Pearls - since 1893. Mikomoto. AUTORE - since 1991. South Sea Pearls | Pearl Jewellery. BALDINI PEARLS - "Created by Christophe Roquigny in 1997 in Moorea and transfered in Bora Bora in 2004." Fallon - since 2008. "Modern Pearls." Laura Perles - "Welcome to the world of Tahitian Black Pearl, highlighted by best quality golden and silver jewellery." MISAKI - since 1987. "Innovative Pearl Jewellery." PASPALEY - since 1932. "Paspaley is proud to be recognised as the source of the most beautiful and valuable pearls in the world." 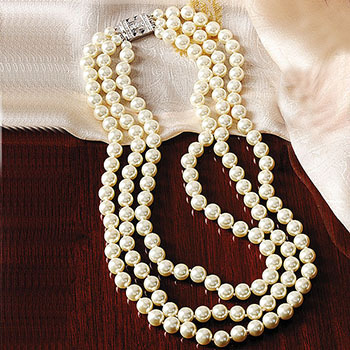 Pearl Paradise - "Luxurious Pearl Necklaces." Pearl Jewelry Over 80% Off Of Retail. Founded in 1996 and brought online in 2000, Pearl Paradise has grown into the world's largest online pearl company. Rosendorff - "Excellence since 1963." Taaroa Bijoux - since 2000. Tahitian & Australian South Sea & Taaroa pearls. Online jewelry from French Polynesia. The PEARL Source - since 1991. "The Pearl Source is known for its exquisite collection of high-end pearl necklaces." Winterson - since 2010. "Luxury Pearl Jewellery." Discover the beautiful collection of pearl jewellery at Winterson. A classic gem and a perfect gift for every occasion, pearls have been our inspiration for over 50 years. Our experience means that we know how to present the unique qualities of each pearl perfectly.